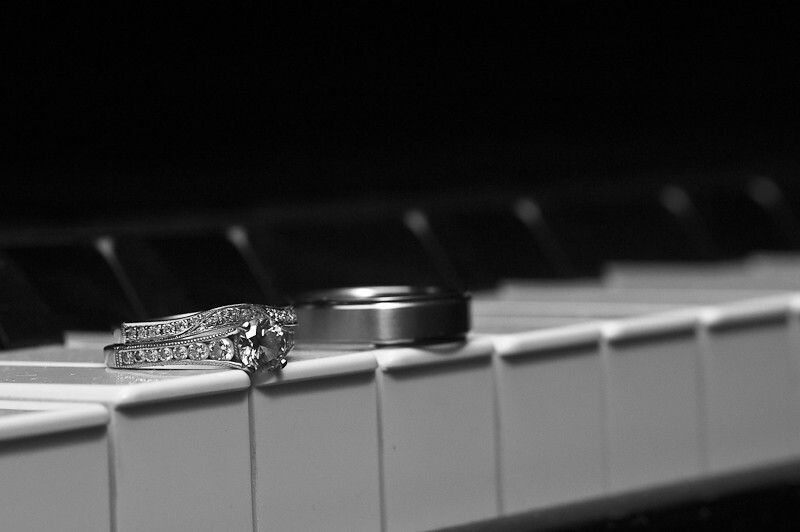 Rings on piano keys from a recent wedding we photographed. The rings are a symbol of unending love in a wedding because they are an unbroken circle. After I placed the rings on the keys of a piano, I starting thinking about how the piano in the right hands can produce beautiful music. One key alone does not produce music, keys played in the wrong order will make sounds but not music. When in the hands of a master the sounds flow smoothly together into music and is enjoyable hear. It reminded me of marriage, two people alone do not make a marriage it takes focus on the Master to keep the marriage flowing in harmony. To see more photographs from this wedding hop over to Worley Arts. Beautiful photo! It looks lovely in black and white. I love the symbolism in this photo. Beautiful! Absolutely beautiful! The black and white makes the shot even more dramatic. This is lovely and so is the analogy! What a great wedding photo idea (and nice aperture)! I trust that the bride and groom will be making sweet music together for many many years! Great photo and words so true.